Whither (or Wither) Equality in Teacher Education? Entrance to teacher education is a highly political issue with high entrance scores and some form of aptitude test being the norm. Based on a Featured Presentation at The Asian Conference on Education 2016 in Kobe, Japan, this article by Dr Yvonne Masters of the University of New England, Australia, is a discussion starter to examine the questions: who is missing out and is equity being ignored under the guise of quality? This is an invitation to all of you interested in the future of teacher education to join a conversation about what matters in teacher education. This can be done by using the comment box below this conversation opener. Most, if not all of you, will have experienced some formal education and several teachers along the way. These teachers may be memorable as teachers who inspired you to learn more and to do well or, unfortunately, for the opposite reasons. Many of these teachers will have undertaken some form of teacher education whilst some may have entered the teaching profession through other pathways or because, if you are old enough for this to have happened or live where it is still the norm, have become teachers with no specific qualifications and because they wanted to teach. It is even possible that you did not know which teachers were which: trained or untrained. Currently, in Australia, entrance to teacher education is a highly political issue and teacher education candidates must meet both high entrance scores and some form of aptitude test. The questions are: who is missing out and is equity being ignored under the guise of quality? Education is, unarguably, important and student learning is central as an integral part of any education. It is also beyond doubt that teachers play a critical role in such learning (Darling-Hammond, 2000; Hattie, 2003; Killion & Hirsh, 2011; Panayiotou et al., 2014; Rowe, 2003). Teacher education, globally, is under discussion and the introduction of teacher standards has been one way in which quality has been spotlighted (Bourgonje & Tromp, 2011; Erebus International, 2008; Page, 2015). The introduction of standards has been accompanied by a discussion around the selection of teacher candidates prior to entry into initial teacher education courses (Bowles, Hattie, Dinham, Scull, & Clinton, 2014; Heinz, 2013; Iucu, Mironov, Borzea, & Marin, 2014). There is a unanimous view that we want the best people to go into initial teacher education. It is clear that teaching demands both academic skills and personal qualities to engage students and foster learning. … By selecting the right people, the investment of providers, school systems and schools in developing these new teachers will be put to best use. To achieve this, all providers must use a blend of sophisticated approaches to select entrants that have both the academic skills – including literacy and numeracy skills – and the desirable personal attributes for teaching (p. x). Ideas about what makes a good teacher are important in thinking about educational reform, and have come into focus recently. These ideas are contested and open to change (p. 213). • organisational and planning skills (Australian Institute for Teaching and School Leadership [AITSL], 2015, p. 1). … all providers must use a blend of sophisticated approaches to select entrants that have both the academic skills – including literacy and numeracy skills – and the desirable personal attributes for teaching. Providers will be required to publish their selection processes for all initial teacher education programs to justify that they are selecting those best suited to the teaching profession on an appropriate basis (Teacher Education Ministerial Advisory Group, 2015, p. x). Discussions about improving the quality of teachers become heated as any attempt to argue against measures imported to improve this are seen as an argument against the need for quality teachers. However, the term “quality” itself can be open to interpretation. In earlier centuries in Britain, the ‘Quality’ were the upper classes, rich people who were generally members of the peerage. In this instance, “quality” can be seen as elitist and exclusionary. The new measures being proposed, in Australia at least, have the same elitist and exclusionary taint if looked at in terms of the diverse pathways that teachers take, even now, into their profession. 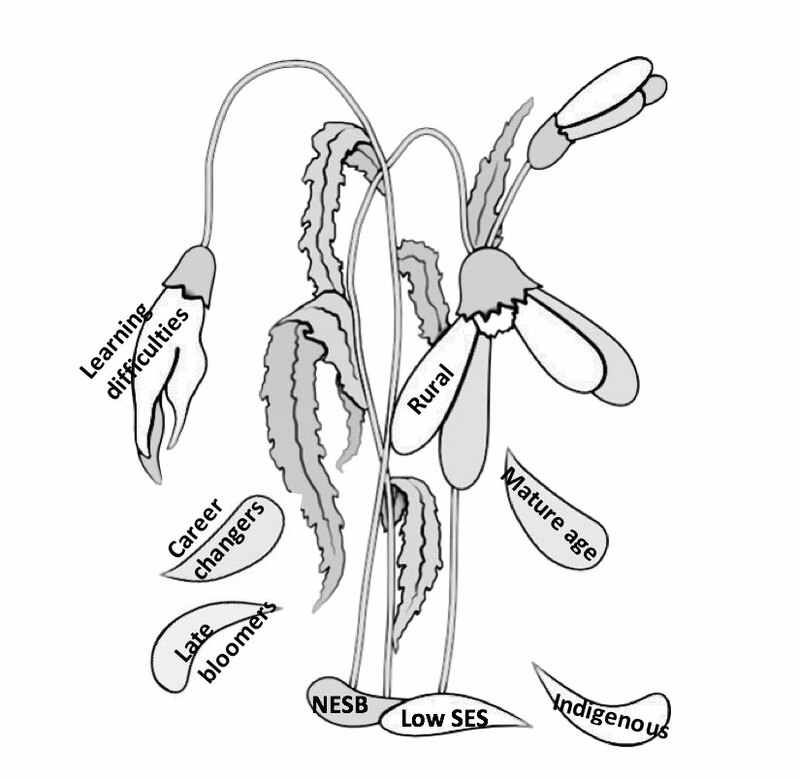 Some of the excluded groups under the new selection guidelines are identified on the metaphorical withered plant of teacher education in Figure 1 below. with the proviso that the course graduate outcomes (my italics) are achieved, there is also the statement that “it is expected that each provider will use the same measures of non-academic capability for all (my italics) applicants to their particular programs (AITSL, 2015, p.4). This latter statement seems to indicate that all teacher education candidates have had equal opportunity to show those competences listed earlier which is not the case. It makes one think about Orwell’s (1945/1968) Animal Farm where “all animals are equal but some animals are more equal than others” (p. 114). Many possible teacher education candidates from these groups, measured on inputs, will probably be excluded from pursuing teacher education courses, but it should be noted that most of these students exit with the necessary graduate outcomes. The “late bloomers” are generally among the school leavers, but also some first and second year tertiary students fit into this category. These students are those who are often satisfied with a basic “Pass” and/or those who have not yet matured to demonstrate the required non-academic capabilities. Many of these later thrive in university courses, meet the graduate outcomes, and become excellent teachers. Many non-English speaking background (NESB) students have come from other countries as refugees or are among those who were able to follow normal immigration channels, but are leaving their countries for security reasons. Those who seek to enter teacher education have just learned English. It takes time for these students to develop the “academic” language of higher education, but outcomes are often excellent as they demonstrate a willingness to learn and conscientiousness (two of the key capabilities) throughout their study. Based on current data from my own university, many mature age students have already had one career and have a range of experiences to bring the teaching profession. However, whilst those who have graduate degrees, gained for their first career, will have no selection issues, anyone without a first degree may have problems demonstrating their academic competence. Many of my own students came from careers such as plumbing, carpentry and hairdressing, to name but a few. These students often left school early for a range of reasons (e.g. lack of motivation, poor results, and financial pressures) and have decided to come into teaching later in life. Other mature age students have put off careers for family reasons either carers to older family members or carers for their own children. These students have often required extra assistance with the academic demands but have demonstrated a strong motivation to teach and self-efficacy (key capabilities). Again, these students demonstrate the required graduate outcomes for teacher education. the “remoteness gap” is not unique to NSW or to Australia. Students from rural areas underperform in the Programme for International Student Assessment (PISA) reading test in almost every country in the Organisation for Economic Cooperation and Development (OECD). However the gap is larger in Australia than the average of other OECD nations (New South Wales Department of Education and Communities, 2013, p. 3). While these students have often entered Australian universities in the past through what is known as early entry or principal recommendation, this pathway has been removed. These students often did not have the highest of entrance scores, but their principals had indicated that they had the necessary requisites for university study. A research project that I undertook in 2014 demonstrated that the exit Grade Point Average of students who had entered with lower entrance scores or on principal’s recommendation did equally as well by the end of their course. Also, these rural students returned to rural schools for teaching, a premium in a country where there are fewer teachers applying for rural positions. The literature regarding the disadvantage for students from low socio-economic backgrounds and also for indigenous students is prolific, although it must be stated that much of this literature comes from a deficit model, looking at what these students do not have rather than what they do have. As with the other groups mentioned, generally these students, who may struggle at the start of tertiary study, develop throughout their courses and meet the necessary graduate outcomes. Unfortunately, in the case of indigenous students, the percentage who succeed is much lower with many dropping out during their first year. However, Australia is in dire need of indigenous teachers who can work with their students with greater understanding. If these students need to demonstrate the key non-academic capabilities before being accepted into teacher education there will be few indigenous teacher education students. From what I have presented to you, it is clear that I believe that the current methods of teacher candidate selection are flawed. My view is that too great an emphasis placed on inputs rather than outcomes. We all grow as students and develop the capacities needed. While I do not argue with the need for quality teachers, I do question whether they only come from the academic “cream”. In reflecting for a long time on this topic, I realised that I would have not been accepted into teacher education on my Year 12 results and yet I have been a successful, and I would argue quality, teacher. • How can an argument be made when quality is the issue? • Don’t we all agree that quality matters? • What do we mean by “quality”? • Can “quality” be decided before any student enters teacher education? • Are there winners and losers in certain measures? I also asked as a concluding question: what is the way forward? I hope, dear readers, that some of you will join me further discussion and that we can find ways to give voice to the issues and raise some alternatives. Dr Yvonne Masters gave this Featured Presentation at The Asian Conference on Education 2016 in Kobe, Japan. Australian Institute for Teaching and School Leadership. (2015). Action Now: Selection of Entrants into Initial Teacher Education, Guidelines. Melbourne, Australia: Australian Institute for Teaching and School Ladership. Erebus International. (2008). Scoping Study on the Development of Teaching Standards in the Broader Asia-Pacific Region. Canberra, Australia: Department of Education, Employment and Workplace Relations. Iucu, R., Mironov, C., Borzea, A., & Marin, E. (2014). Some insights into the approaches to selecting potential candidates to become student teacher. Procedia – Social and Behavioral Sciences, 128, 355-360. doi: 10.1016/j.sbspro.2014.03.170. Killion, J., & Hirsh, S. (2011). The elements of effective teaching: Professional learning moves vision, framework, and performance standards into action. Journal of Staff Development, 32(6), 10-12. Orwell, G. (1968). Animal Farm. Harmondsworth, Middlesex: Penguin Books Ltd.
Panayiotou, A., Kyriakides, L., Creemers, B., McMahon, L., Vanlaar, G., Pfeifer, M., . . . Bren, M. (2014). Teacher behavior and student outcomes: Results of a European study. Educational Assessment, Evaluation and Accountability, 26(1), 73-93. doi: 10.1007/s11092-013-9182-x. Rowe, K. (2003). The importance of teacher quality as a key determinant of students’ experiences and outcomes of schooling. Paper presented at the Building Teacher Quality: What Does the Research tell Us? Australian Council for Educational Research Annual Conference 2003, Melbourne, Australia: Australian Council for Educational Research. https://www.det.nsw.edu.au/proflearn/docs/pdf/qt_rowe2003.pdf. Teacher Education Ministerial Advisory Group. (2015). Action Now: Classroom Ready Teachers. Canberra, Australia: Australian Government. Is there a way to develop quality while maintaining equity and inclusivity or is ‘quality’ elitist and exclusive by its very nature? Dr Yvonne Masters is currently an Adjunct Senior Lecturer in Professional Classroom Practice in the School of Education, University of New England, Australia. She has been a teacher and teacher educator for 40 years and is passionate about education. Her research spans online teaching, teacher education policy and teacher identity and she has received external grant funding for several projects linked to teacher education and online learning.